Following graduation I returned to my home county of Cornwall where I joined the NHS with the hope of gaining clinical experience in the field. As a Research Assistant in the Haematology/Oncology trials team, I was involved in all aspects of clinical trials: from trial setup to patient monitoring and sample processing in patients with a variety of haem disorders. Not only did I gain valuable clinical skills, but also an understanding of research in its entirety, making relevant all that I had investigated in the laboratory. 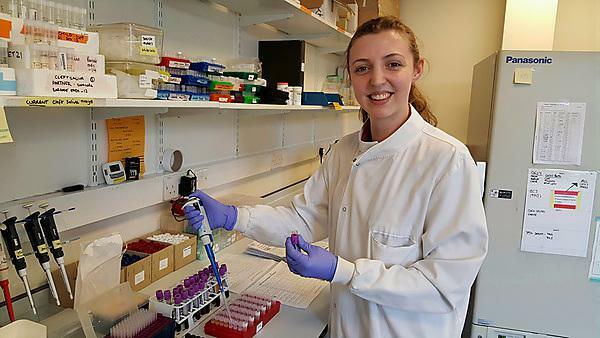 I decided upon a move to Bristol and since then have been working as a Laboratory Technician in a Bioresource facility as part of the University of Bristol. I have recently been accepted to undertake a PhD in leukaemia research at the University of the West of England. Though my final goal has certainly stayed the same, it wasn’t until completing my degree that I realised all of the options I had available to me. I knew that I wanted to pursue a research career, applying for some PhD’s without success. With advice, I then sought after some real industry experience and now, soon to start my PhD, I appreciate the importance of this time. There is not just one but many paths towards a focused career and it is so important to explore as many as you can, or you might miss opportunities that such a vast field has to offer. I think the most difficult part in a research career is the competition. There are so many individuals out there who are in the same stage of their career as you and this means that when applying for further positions, you have to stand out. This is a skill in itself, and it has taken several attempts to not be disheartened by rejection. I have strived to immerse myself in opportunities, for which Plymouth University and the people there have been instrumental. For me, striving for more has meant moving away from family, which has also been one of the hardest aspects. It is so difficult to choose just one moment. I found my laboratory projects in both my research placements and final year project very exciting, particularly with the prospect of discovering something new and being given the freedom to work independently. Since then I have enjoyed being involved in some pivotal research studies, for example a Phase 1 haemophilia trial in the NHS. Reflecting on what I could have done better or differently has been a huge part of my development, which is why I have no regrets about my career so far. I do only wish that I had realised sooner my career aim when at university and developed those passions I now have earlier. I appreciate, though, that these things could only have developed over time, through the academic and personal experiences that have shaped me as a person and directed me into an exciting career path. Experience is key. Working directly in the field is the best way to learn the key skills and processes: develop your passions and understanding. My research placement transformed me from an average student to a high achieving one with the confidence and independence which is so essential for a postgraduate career. I’d say to anyone studying to network wherever you can, attend conferences, seminars, and meet people in the field; but most of all, keep trying and try to understand from the start that the field is difficult and being proactive and hard-working really does pay off in the end. Plymouth provided the structure for not only completing a degree, but getting the best out of myself. I was able to attend conferences, weekly seminars in all areas of biological sciences, and network with experienced people through the closely-webbed departments. The greatest help to me and my career was the undertaking of a funded placement within the University following my second year. The development led to me graduating with a first class degree and awards for my cohort. While being encouraged to work independently, I had continuous support from academics, which has continued even after graduation. My time at Plymouth University was a solid foundation for my developing career. I am so lucky to have taken many happy memories away with me from studying at Plymouth. Graduation was one of the highlights; a moment where my closest friends, course mates, family, and lecturers were all in one place. It was the perfect way to leave Plymouth, having recognised our achievements. I’m still in contact with a number of my former lecturers and supervisors, who continue to be supportive of my development. At Plymouth, I met so many incredible people from many different course groups, including life-long friends. Absolutely, yes. From studying at Plymouth I gained more than I could have imagined, opening up a future I never thought was there for me. It has the structure, central location and facilities for you to achieve your best – as long as you choose the course that’s right for you. For more information about studying biomedical science, please visit our BSc (Hons) Biomedical Science course page. For more information about our range of courses within the School of Biomedical and Healthcare Sciences, please visit the school page. If you would like to find out what other alumni from the Plymouth University Peninsula Schools of Medicine and Dentistry are currently doing, please visit the biological, health, chemical and agricultural sciences interest area.